The 2016 Dwarf Stars Anthology contents have been finalized, which constitutes the shortlist for the Dwarf Stars award given by the Science Fiction Poetry Association. The award recognizes the best speculative poem of 1–10 lines published in the previous year, and is designed to honor excellent scifaiku, tanka, cinquains, and other types of short poems that tend to be overshadowed in SFPA’s Rhysling Award competition. 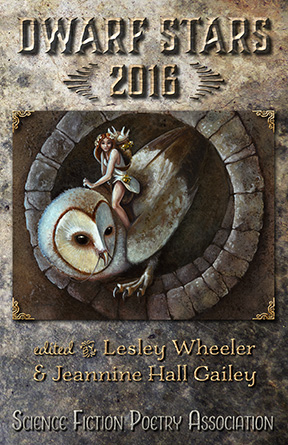 The poems in the 2016 Dwarf Stars anthology were selected by editors Jeannine Hall Gailey & Lesley Wheeler. SFPA members have until August 31 to vote their favorite short-short poem from the anthology and determine who will receive the Dwarf Stars Award. A Field • Amelia Martens • Hampden-Sydney Poetry Review 41, Winter 2015, and The Spoons in the Grass are There to Dig a Moat (Sarabande Books, 2016). This entry was posted in Awards and tagged Dwarf Stars, Science Fiction Poetry Association by Mike Glyer. Bookmark the permalink.